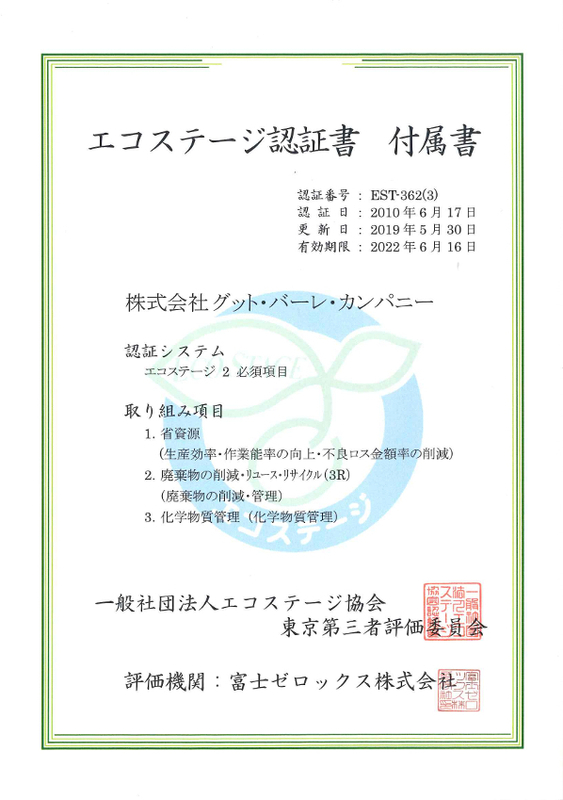 On January 12, 2007, we acquired ISO9001: 2000 certification, international standard for quality management. 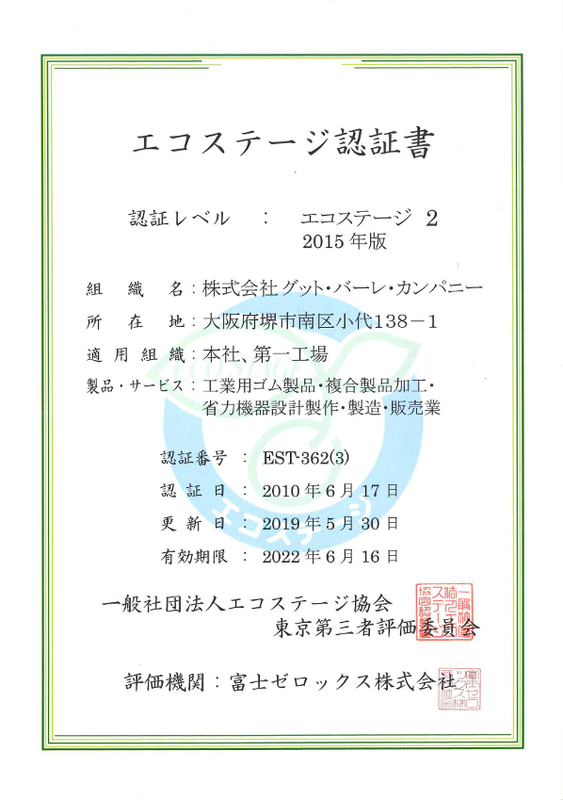 With the acquisition of this ISO 9001: 2000 certification, we intend to enhance quality control more than ever and stably provide high quality technology and services to our customers. We sincerely hope for your continuous support. We will respond to customers' advanced needs with our continuous technological innovation as our corporate philosophy. We will fulfill customers’ requirements and conduct companywide quality improvement activities to realize your satisfaction. We will clarify each customer’s requirements, expectations, needs and other related requirements, and continue to provide products that meet those requirements. We will maintain the effectiveness of our quality management system and strive for continuous improvement. In order to achieve the quality policies, we will take actions setting up appropriate targets for our quality policy, and will regularly review them. We will review the quality policies watching whether they continue to be appropriate. We will constantly pursue new technologies, processes and materials friendly to the environment, strive to provide services, and work continuously to improve the environmental management system and prevent pollution. We will strictly observe laws and regulations including environmental laws and other requirements agreed by our Company, as well as maximize efforts to ensure that our business partners and customers can use our service safely and securely. We will set up concrete objectives and targets as the following items and promote the activities with all our employees. We will strive for environmental conservation by promoting energy and resource saving. We will promote 3R activities and aim for reduction of waste. We will enrich our management of environmental chemical substances. We will promote environmental education for our employees, always share knowledge on the new environment and use it for practice. We will thoroughly enforce this environmental policy within the company, also make it widely publicized outside the company and strive to collaborate with related parties. We will formulate an action plan as follows so that employees can demonstrate their abilities, harmonize their work with their family life and develop comfortable working environment. Target 1: We will provide our employees with dissemination and information on public benefits, its system of childbirth, such as prenatal and postpartum childbirth leave, childcare leave, childcare leave benefits, and social insurance fee exemption during childcare leave. From September, 2015, we will arrange baby-related laws and public benefits in chronological order. From January, 2016,we will create a leaflet on the system and distribute it to employees. Target 2: We will introduce exemption system for overtime work to employees raising children whose ages are lower than elementary school entrance age in order to support the compatibility of employees’ working life with their family life. From September, 2015, we will consider and revise the "Child Care and Nursing Care Leave Regulations" to achieve the target. From January, 2016, we will　expand the exemption from overtime work until employees’ children’s elementary school enrollment and thoroughly disseminate it. Target 3: By March,2018, we will set up and implement no overtime work days to reduce overtime work. From September, 2015, we will carry out questionnaire survey for employees and examination of problems in each department. From April 2016, we will implement no overtime work days (publicity and dissemination to employees), job analysis of each department, inventory of operations and efficiency improvement. Target 4: We will try to introduce a system that allows employees to work from home for about one day a week. From January 2016, we will study on contents and subjects of　teleworking. From January, 2017, we will conduct the above teleworking measure on a trial basis, analyze issues and consider the possibility of full-scale implementation. 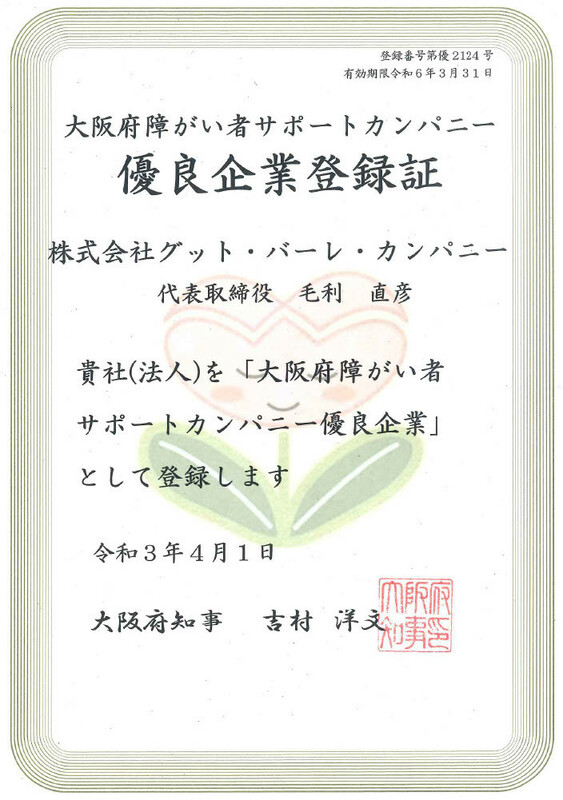 Our company has registered in Osaka Prefecture's Disabled People Supporting Company System. 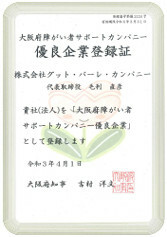 The system encourages companies which actively engage in employment of people with disabilities to register as "Osaka Prefecture Disabled People Supporting Company" or "Osaka Prefecture Good Supporting Company for Disabled People." We will widely disseminate the system together with Osaka Prefecture, and promote further expansion of employing people with disabilities.